First you will paint all of your paper bags with acrylic paint and let them dry completely. I used Americana paints in Cherry Red, Lavender, Jack O' Lantern Orange, Antique White, Kelly Green and Black. Next you'll cut out shapes from construction paper to embellish your puppets. Eyes can be drawn with a black marker on to white paper and then cut out. Alternatively, you can use googly eyes. For mouths, glue the teeth onto the mouth hanging over the edge. Then trim by cutting around the outline of the mouth. You can make simple clothes like Frankenstein's jacket, Dracula's cape or the witch's dress from construction paper. For the mummy, use a black marker to draw on lines to look like bandages. For the Jack O'Lantern, use an orange marker to draw on lines. Other embellishments you can include are bolts for Frankie's neck, use a hole punch in purple paper for the witch's nose wart, and use a marker to draw on noses and Frankie's stitches. Use glue stick to attach everything then have a Halloween puppet show! 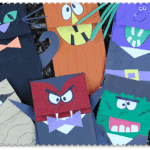 This project for Halloween Craft: Paper Bag Puppets was printed from CraftsbyAmanda.com - https://craftsbyamanda.com/halloween-craft-paper-bag-puppets/ and can only be printed for education or personal use.